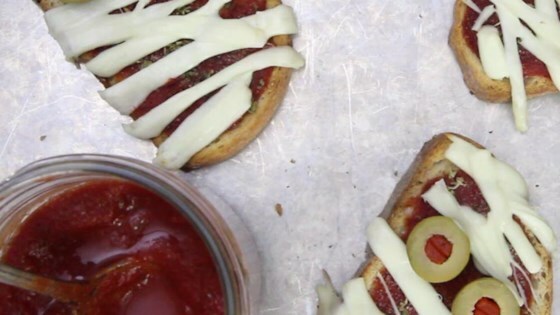 "Mummy pizzas are creative, easy to make, and yummy! Perfect for dinner before Halloween trick-or-treating." Place bread on a baking sheet; toast in oven 3 to 5 minutes. Spoon pizza sauce evenly over toast. Sprinkle with oregano and garlic powder. Use olive slices to make 2 eyes near one end of the toast. Place strips of string cheese across toast to make "mummy wrap." Bake in preheated oven until cheese melts, 3 to 5 minutes. Instead of French bread slices, you can substitute English muffins, Sandwich Thins or flattened refrigerated biscuit dough for the crust (oven time will vary). For pickier eaters, use black olive or pepperoni "eyes." Perfect! The kids on the block love these, thanks for sharing.